Follow these precepts and you will revolutionise your life. An absolute must-read... Learn to tear through any obstacle and resolve any conflict. First came Marcus Aurelius, then Frederick the Great... and now there's you. This surprising book shows you how to craft a life of wonder by embracing obstacles and challenge. In this tight, engaging book, Ryan Holiday shines a bright, powerful light on the path to living and leading well. By showing us how to turn failure, obstacles and plain old every-day frustration to our advantage, he offers up a host of easy-to-use tactics that each of us can put to work to follow our dreams. Read it, learn from it, and get cracking! My life has been beset with obstacles. It takes practice (and pain) to surmount them and achieve success. Ryan's book is a how-to guide for just that. I suggest these [books] because they really open up 'how' you think about life and in turn work, success/challenges/setbacks, and in general, yourself. I believe that the more you can understand yourself and broaden your approach to work, the easier it will be to find work that energizes you. Finally, I'm a team player at heart, and love working with others to achieve a huge goal so a portion of these deal with team composition and performance too. I remember reading The Obstacle Is The Way by Ryan Holiday on a road trip one time. It was during a time that I was feeling particularly frustrated with my business and was just having an all around hard time. The idea of the book is that if you recognize things are hard, you should keep going. It teaches you to seek out the obstacles because few people even try and even fewer make it past the obstacles. When I got home from my trip, I remember sitting down and realizing I was being stubborn and not doing the work I needed to do. Immediately, I could tell things were heading in a much better direction. The Obstacle is the Way is another one of his creations that is more related to Stoic philosophy. 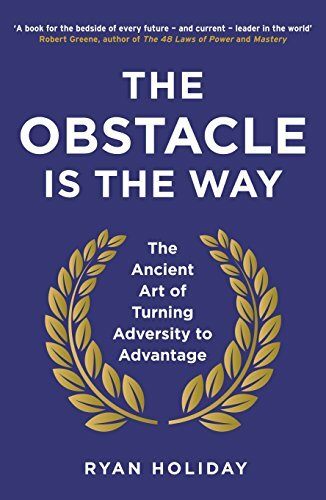 One of my favourite business books is probably The Obstacle is the Way by Ryan Holiday. Taking inspiration from Marcus Aurelius, Seneca and other historical figures, he successfully gives the reader actionable steps that apply Stoicism in a modern context. This book is great for anyone who cares to take a good look in the mirror and own your stuff. Early on Ryan states, “The obstacle in the path becomes the path. Never forget, within every obstacle is an opportunity to improve our condition.” Holiday consistency challenges the reader to look at problems from a different perspective. A great read for entrepreneurs and those in pursuit of personal growth alike. This book introduced me to the concept of Stoicism and how we can choose to be happy instead of always vying for something in the future. This book teaches one that when faced with a challenge or obstacle, one should continue to pursue the goal as that is the way towards success, happiness and fulfillment. It’s an excellent, modern-day recap of the Stoicism Philosophy, and I highly recommend it.